Useful for electronics hobbyists, this linear workbench power supply converts a high input voltage (12V) from the SMPS of a PC into low output voltage (1.25 to 9 volts). An adjustable three-pin voltage regulator chip LM317T (IC1) is used here to provide the required voltages. The LM317T regulator, in TO-220 pack, can handle current of up to 1 amp in practice. Fig. 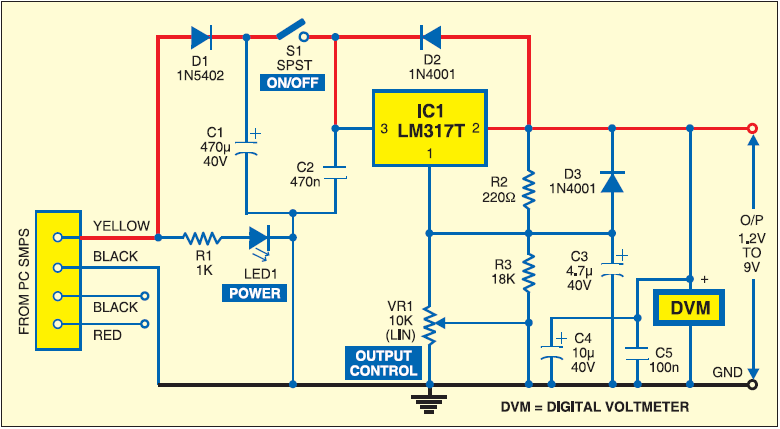 1 shows the circuit of the desktop power supply.Regulator IC LM317T is arranged in its standard application. Diode D1 guards against polarity reversal and capacitor C1 is an additional buffer. The green LED (LED1) indicates the status of the power input. Diode D2 prevents the output voltage from rising above the input voltage when a capacitive or inductive load is connected at the output. Similarly, capacitor C3 suppresses any residual ripple. 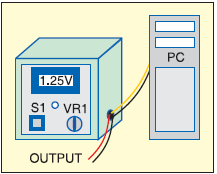 Connect a standard digital voltmeter in parallel with the output leads to accurately set the desired voltage with the help of variable resistor VR1. You can also use your digital multimeter if the digital voltmeter is not available. Switch on S1 and set the required voltage through preset VR1 and read it on the digital voltmeter. Now the power supply is ready for use. power connector of the SMPS carefully.